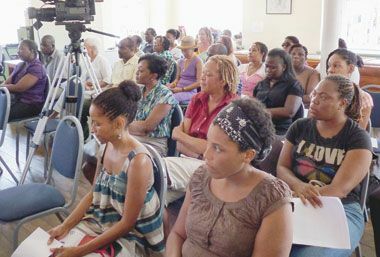 On Tuesday, March 1, the Division, in partnership with the Caribbean Development Bank (CDB) and the Basic Needs Trust Fund (BNTF) launched a nine-month pottery workshop at the National Trust Building (formerly Old Public Library) in Kingstown. The National Trust building is home to artifacts made of pottery, which were brought and left here by the regionâs first inhabitants, who arrived here as early as 150 AD. Director of the Adult and Continuing Division of the Ministry of Education Francis Clarke-Palmer, making remarks at the launch, said that the programme provides developmental intervention for Vincentians. She said that her hope is for the workshop to create great artisans, who would be able to sustain their own livelihoods. Also speaking at the launch were BNTF Project manager Kenneth Douglas and CDB Operations Officer Yolande Yaw, who both praised the initiative to revive the art of pottery in St. Vincent and the Grenadines. Douglas indicated that his organization will provide the workshop with various tools to carry out the process of producing the items, as well as business training which he thinks is important for the sustainability of the programme. âWe do believe that even if you teach people how to use their hands to craft what they have to do, we want their minds as well to be crafted as to how to be able to manage their own little business. Yaw, sharing the sentiments of Douglas, also called on the participants to make the most of their training, in and out of the workshop. The man at the helm of the programme, workshop facilitator Conroy Dyer, giving an overview of the project said that he expects the art of pottery to be revived through this programme, and that he hoped the participants will play a major part in this. A presentation on various types of pottery which was left here over the centuries was made by Dr. Margaret Bradford, an archeologist who has studied pottery in the region over the years.